AMMONNEWS - Turkey said on Sunday it had finalized preparations to create more safe areas in Syria, which would allow the return of refugees who have fled the civil war. 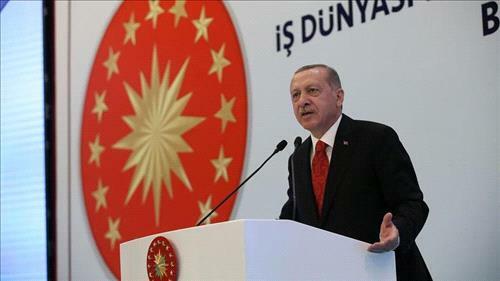 Speaking at his AK Party’s provincial headquarters in the Black Sea city of Trabzon, President Tayyip Erdogan said a quarter of a million people had already returned to liberated areas in Syria. “God willing soon we will have liberated more places and made more areas safe,” he said. Turkey is host to 2.7 million refugees from Syria. Turkey is carrying out an offensive in northern Syria’s Afrin region against the Syrian Kurdish YPG militia, which Ankara considers a terrorist organization linked to Kurdish militants waging an insurgency on Turkish soil. The Afrin campaign is Turkey’s second cross-border operation during Syria’s seven-year-old civil war. The first, dubbed “Euphrates Shield”, targeted ISIS and Kurdish fighters further east than Afrin, and was completed in early 2017. Erdogan said diplomatic and military efforts in Syria’s Idlib province, where Turkey has set up a dozen military observation posts, had been accelerated to avoid a “catastrophe” like those seen in other parts of Syria. Syria’s government and allied forces backed by Russia and Iran have swiftly recaptured other rebel strongholds in the southwest and vowed to push on and recover all of the country. Idlib is the largest remaining Syrian rebel-held enclave and there are fears of further bloodshed in the event of a government-backed offensive. Erdogan also said Turkey was taking steps to save Iraq’s Qandil area from being a “nest of terror” and that if needed northern Iraq’s Sinjar region could be included in this process. Turkey’s army has ramped up operations in northern Iraq, with the aim of destroying Kurdistan Workers Party (PKK) bases in the Qandil mountains, where high-ranking members of the militant group are thought to be located.